The digital age has led to an evolution of the workplace and brought about a shift in the way organizations and individuals work and function. The linear work set up has given way to agility at work, a linear role progression is being replaced by working across a lattice, and networking is key to success in the Digital Age; And there is one word that befits this shift – VUCA. 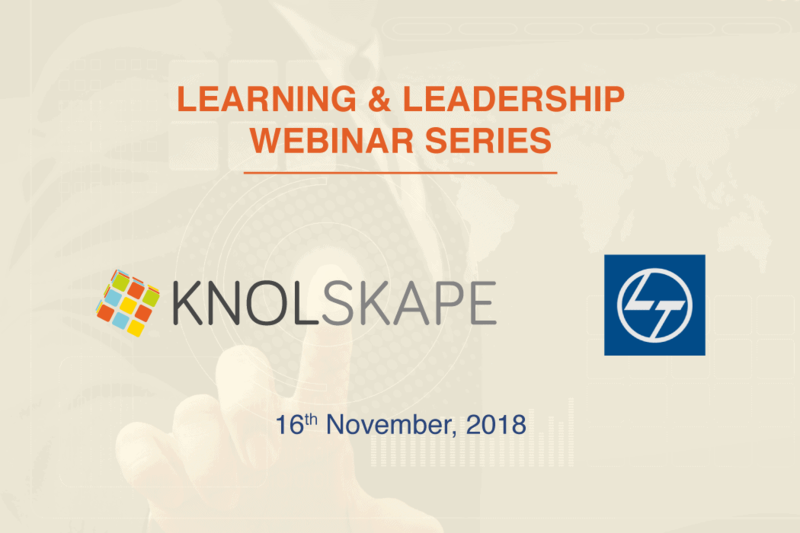 Thus, in an attempt to understand and unravel the best practices that can help organizations work in the VUCA world, KNOLSKAPE presents the ‘Learning and Leadership’ Webinar series. The webinars help drive dialogue with HR and L&D professionals on topics related to Digital and the changing dynamics of today’s workforce. 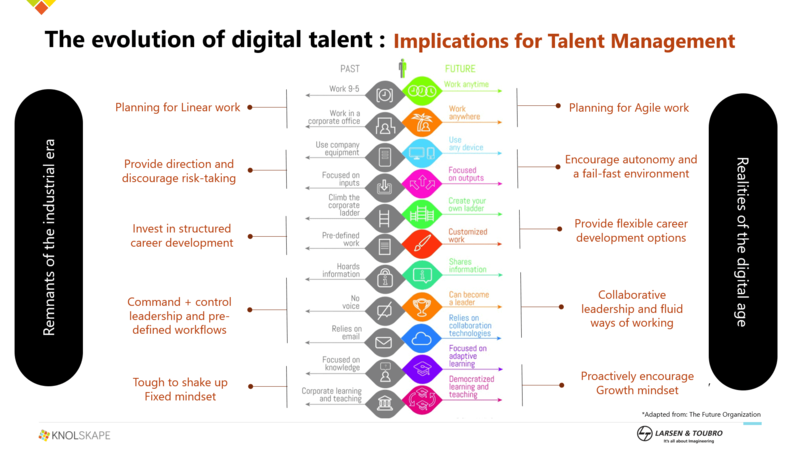 In the first of the webinar series, we were joined by Swatee Sarangi, Head HR – Capability Development Corporate HR at Larsen & Tourbo, to share her opinion on ‘The Evolution of Digital and its implications for Talent Development. There are three dimensions to succeeding in the digital world: (a) thinking beyond existing business models, (b) aligning with customers’ needs: being empathetic when interacting with them and (c) improving the efficiency of current operational processes. Agility, flexibility, and customer centricity are becoming the norm of the day. Thinking beyond existing business models: ANZ Bank’s Australian arm split their traditional teams into 150 start-ups for faster decision making. Improving efficiency of current operational processes: Publicis Groupe unveiled the AI-based platform, Marcel (in collaboration with Microsoft) to connect all 80,000 employees, across 200 disciplines in 130 countries, and provide more seamless communication, collaboration, and anticipation of client needs. Aligning with customers’ needs: being empathetic when interacting with them: Zappos recorded the longest customer service call in history, lasting 10 hours and 43 minutes, exhibiting their core value of ‘customer delight’. The disruption caused by the Digital Age has led to a decline of notable names in the business world which makes us wonder what the secret to strive in this age is. Keeping pace with the latest trends and developments in business is necessary for organizations to stay relevant and not lose themselves given the demands of the VUCA environment. The decline of organizations such as Kodak and Nokia, who were market leaders for decades, but found themselves quickly crumbling with the advent of digital was because they were either unwilling or unable to match the pace of change. In the digital age, it is not just the nature of work that is changing, but, also the nature of the workforce and that of the workplace. 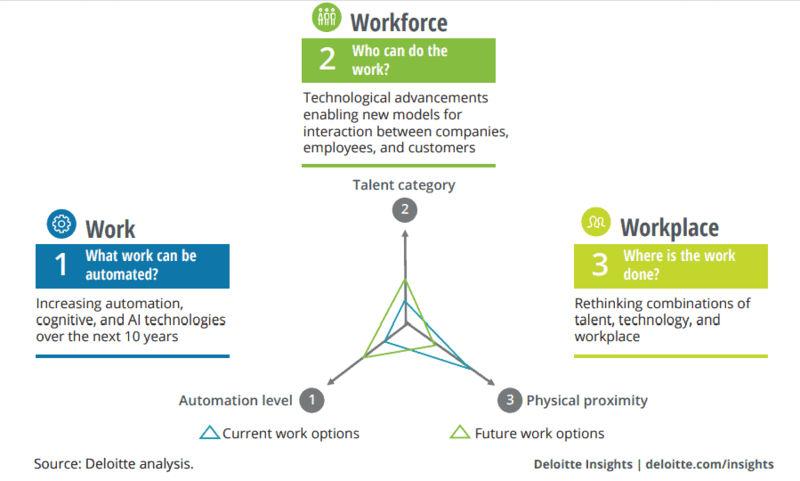 Many jobs previously performed by humans are rapidly becoming redundant thanks to automation, resulting in employees proactively upskilling themselves on skills and mindsets relevant for the digital age. The rapid growth of technology and connectedness is redefining the concept of a workplace, as physical proximity is no longer the basis of getting work done. This requires a new mindset altogether for organizations and employees alike. 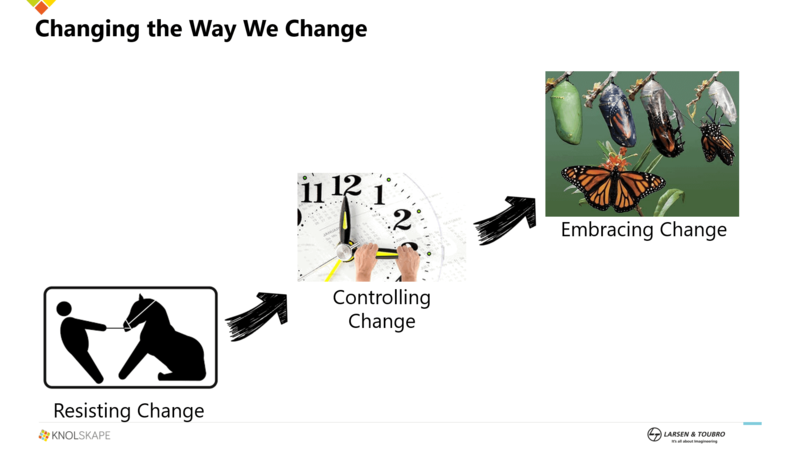 Therefore, focusing on learning to adapt and work within these changing dynamics is important. Learning is synonymous with organizations that want to build their niche in today’s VUCA world. It boils down to individuals’ ability to learn, un-learn and re-learn. However, amid the innumerable expectations of modern learners, the key challenge lies in making the learning stick with the employees and what organizations can do to ensure a seamless learning experience for them. (c) reinforce learning through rewards or recognition when the learning is correctly implemented or applied. The current workforce is the most diverse it has ever been, with 4 different generations – the first of the Gen Zers, Millennials, Gen Xers, and the last of the Baby Boomers. Each generation brings a set of strengths to the table, and it is imperative that organizations leverage the strengths of each generation rather than depending on a single cohort. Therefore, adopting and implementing processes that augment a holistic growth of the employee is crucial for talent development. Values need to remain consistent regardless of VUCA. Organizations and individuals need to stay grounded and deeply rooted in their values to move ahead and scale greater heights. Values define the organization’s mission, vision and the contribution that they choose to make to the industry or to the people around. 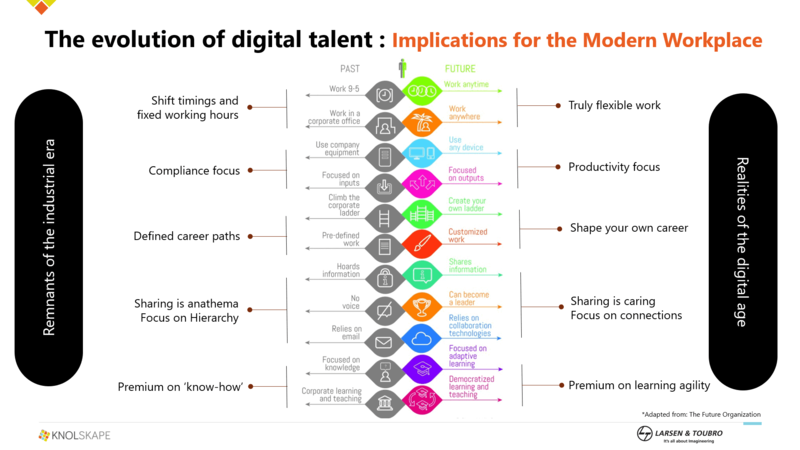 For a detailed understanding of the ‘Evolution of Digital and Implications for Talent Development’, you can listen to the complete webinar here. 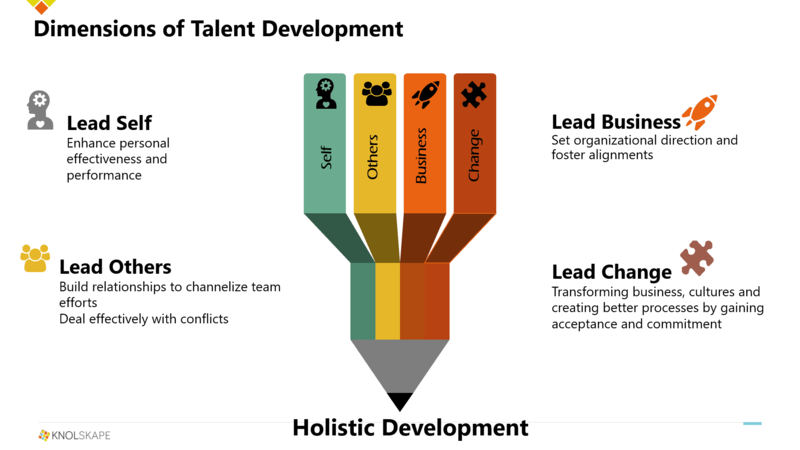 For more details on Talent transformation practices, connect with KNOLSKAPE and get a free demo of our exclusive suite of services and products.